I'm planning on sailing Grand Lake (between St. Cloud and Cold Spring) on New Years Eve day. No snow last weekend this far Up North in Minnesota. I don't care if I can't use my insert runners, because I haven't bothered to make any. Barely an inch of snow this past Sunday on some pretty good ice in my opinion. Looks like anything South of that got a few inches. No where near 9.95 on the ice scale. Guessing around a 3 or 4. Forecast is temp in double digits and the same for the wind. But what do I know? I'm going sailing. I love America. First of all, thanks for introducing yourself. I've been lurking for several years, so I recognize some names (yours for one) but others I need to search out. And thanks for pointing out my stupidity of not realizing that not only can you not fit 80 iceboats on Bald Eagle Lake, you can't sail One on an official course. Not the point I was trying to make. Sarcasm is difficult in the written medium. Once again, the issue of my post was not "where is the good ice". Lake Kegonsa looked beautiful in the pics on the 4LIYC site. The issue is spreading the word. 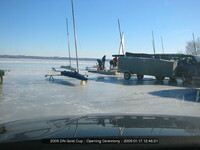 I'm a bit of a newbie to ice boating (this is my fourth season on the ice, only built one DN). I understand the need to move regattas to alternate locations due to weather or other conditions. Is there a reason that the weather or ice conditions Necessitate a move from MN to WI? I understand that Lake Kegonsa has good ice. Is Lake Christina or Green Lake unsailable (how about Buffalo?)? Last posts here don't sound bad to me.